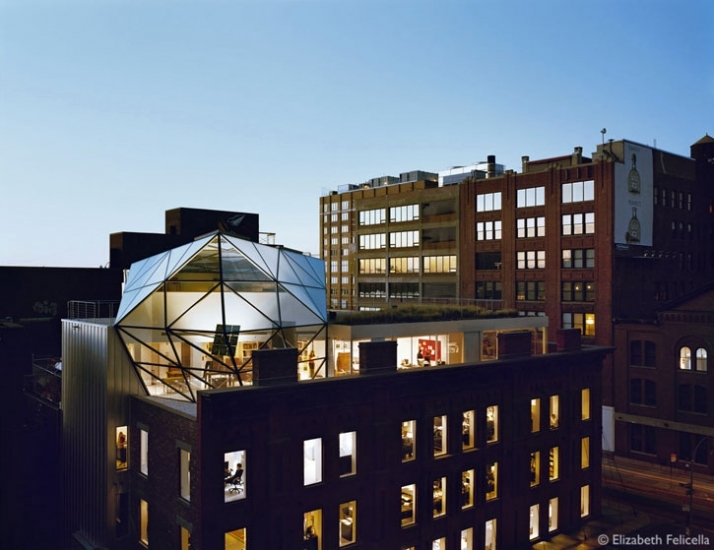 The Diane von Furstenberg HQ built in Manhattan,(TriBeca ) by Work AC. 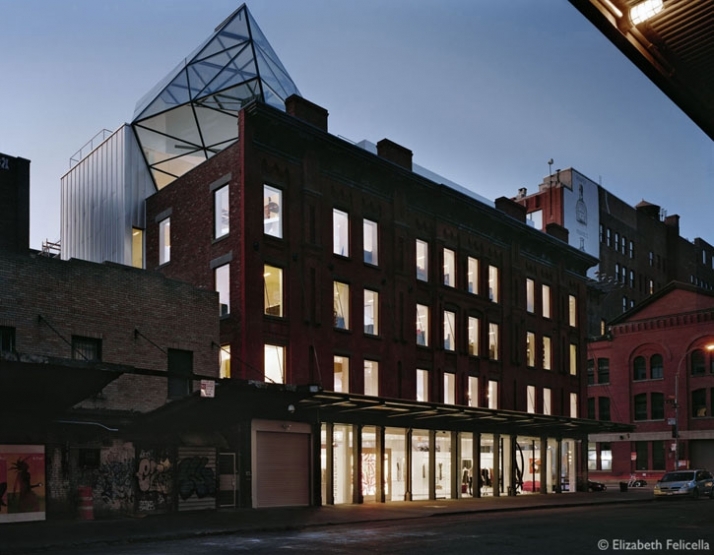 An amazing renewal of an historic building. The light use is accented by the use of hanging crystals. Design Team: Mirza Mujezinovic, Kirsten Krogh, Rune Elsgart, Christina Kwak, Andrew Sinclair, Brendan Kelly, Marc El Khouri, Judith Tse, Lamare Wimberly, Benjamin Cadena, Dana Strasser, Tina Diep, Jacob Lund, Erin Hunt, Martin Hensen Krogh, Martin Laursen, Dayoung Shin, Sylvanus Shaw, Forrest Jesse, Queenie Tong, Christo Logan, Fred Awty, Elliet Spring, Anna Kenoff. Crystals, Research and Development: D. Swarovski & Co. 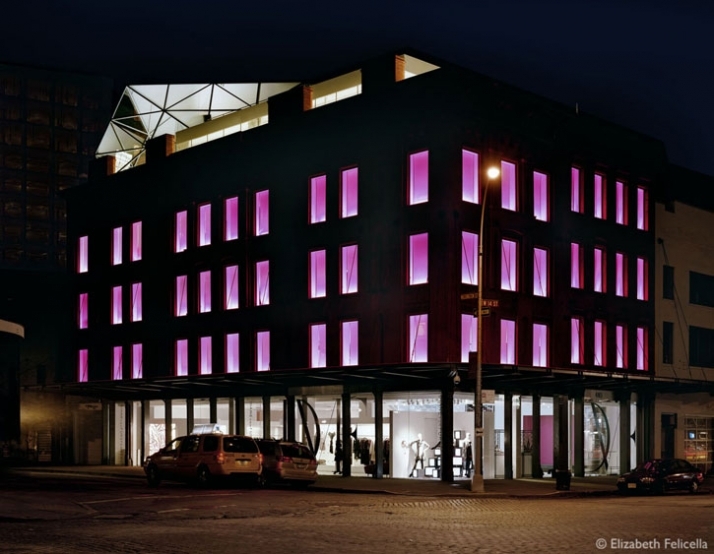 The headquarters building for Diane von Furstenberg (DVF) Studio, a fashion design company, is a new, six-story structure built behind two landmarked facades in New York City’s Meatpacking District. 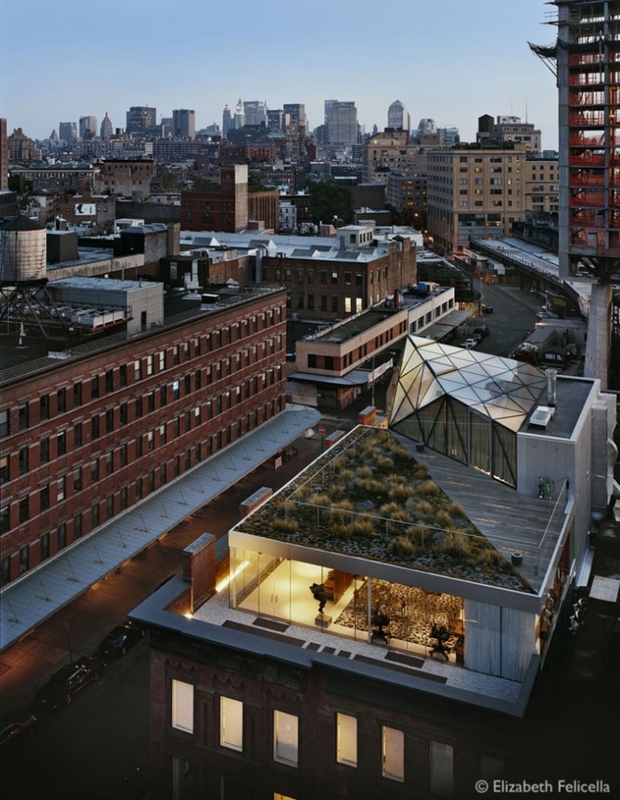 The building houses the company’s flagship store, a 5,000 SF flexible showroom/event space, design and administrative offices for a 120-person staff, an executive suite, and a private penthouse apartment. The project’s diverse program is unified through a singular iconic gesture: a stairway that collects and distributes light from the roof through to the deepest interior parts of the building. This shaft of light is conceived of as an inhabitable and connective “stairdelier” - a cross between stair and chandelier - that cuts diagonally up from the ground floor to the “diamond”, a faceted glass penthouse. 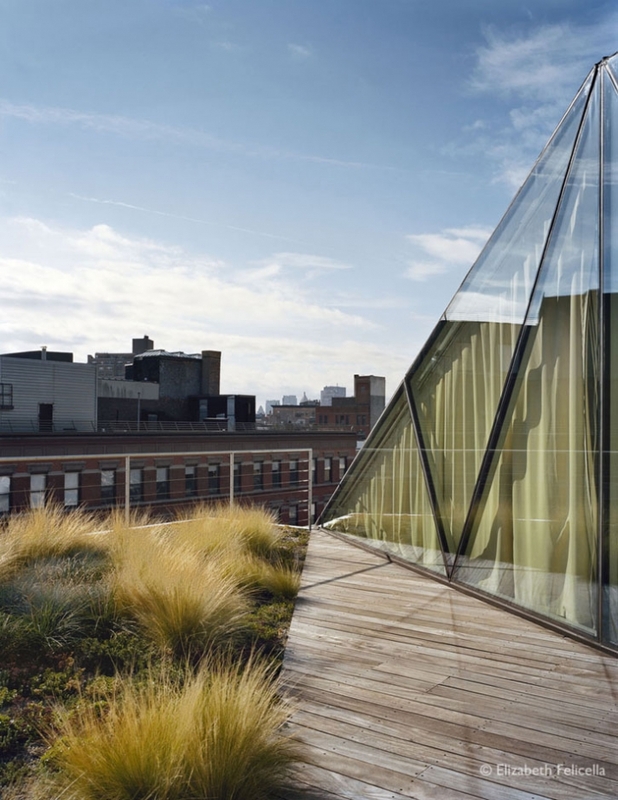 In order to maximize natural light, a series of heliostat mirrors were installed within the diamond. The primary mirror, facing south, tracks the sun throughout the day, reflecting it to a fixed secondary mirror that beams the sunlight down the stair, always at the same angle. 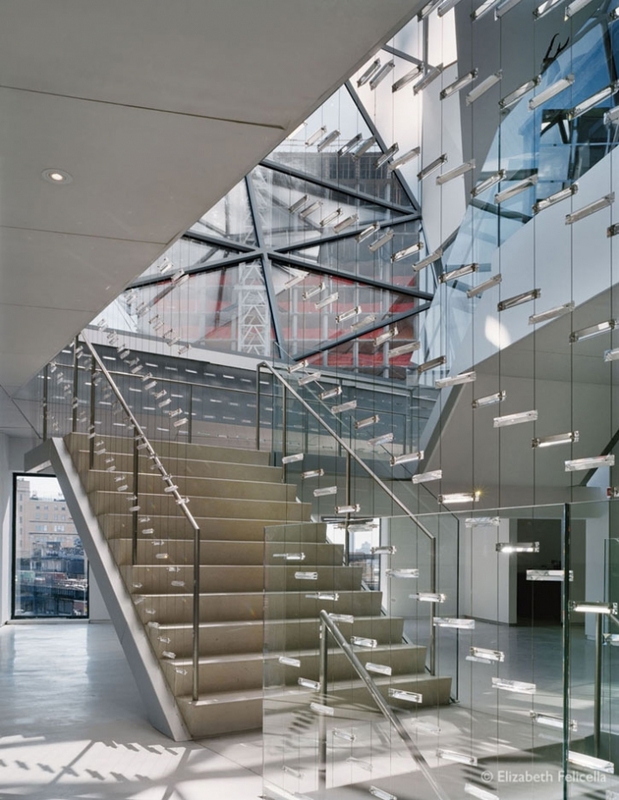 Tertiary mirrors along the stair’s length further direct the light onto the stair’s guardrail - vertical steel cables that are structurally braced with Swarovski glass crystals. The crystals also help disperse the light to each floor. A series of three double-height spaces follow the stairdelier as it makes its way through the building, providing spatial variety to the relatively generic office floors and providing flexibility, allowing the building to transform for special events, parties, and performances. 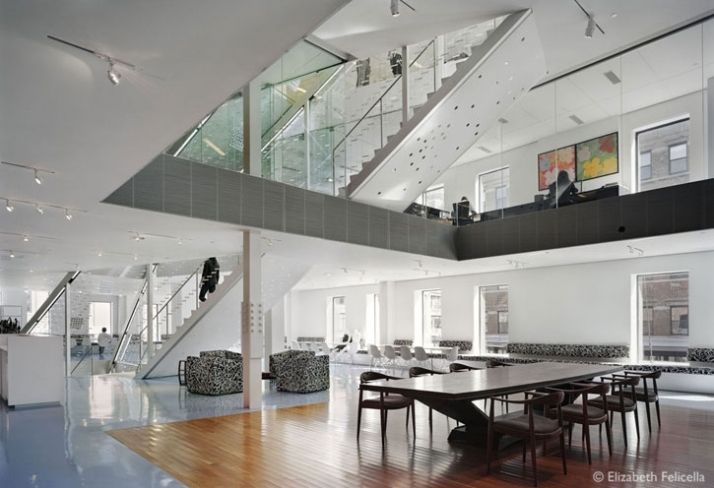 The first of these is the lobby, where the stair widens to create a dramatic presence and Ms. Von Furstenberg’s art collection is displayed around a long reflecting pool. On the showroom floor, a second double-height space can accommodate 100 people as a small black-box theater. In addition, the showroom’s display racks are designed to roll away to create space for events. 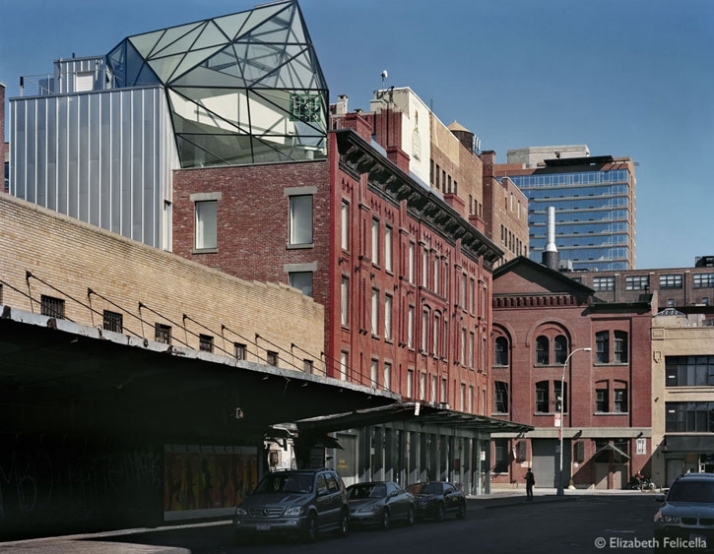 The building is within the Gansevoort Market Historic District and the DVF Studio Headquarters was hailed by the New York’s Landmarks Preservation Commission as a “new model of adaptive reuse for the city.” Instead of hiding new elements behind the historic facades, the project is conceived of as a dialogue between contemporary materials and the renovated elements, making visible both the building’s past and its future. The ground floor is 11′-6″ high panels of clear tempered glass set behind the existing cast iron columns in order to emphasize the distinction between the new and old. Within, the store is designed as “wrap” wall containing all the display fixtures that winds its way diagonally across the ground floor, paralleling horizontally the stairdelier’s diagonal vertical cut through the building. The “wrap” incorporates a luxury room, the cash-wrap area, and a series of three dressing rooms within it. In order to ensure quality, ease coordination and expedite the construction process, a number of elements of the building were created remotely and assembled on-site. The diamond penthouse was built in Olot, Spain from solid steel members that were shipped in containers and bolted together in place. The stairdelier was made from precast concrete and was dropped by crane into the building after the steel framing was up. Similarly, the store fixtures and walls were manufactured off site and then completely installed in less than a week. The building contains many sustainable elements, including geothermal heating and cooling via three wells, 1500-feet deep. By using the heliostat mirrors, the crystals, and ancillary mirrors to bring daylight through the building, the use of artificial light is limited. In addition, at night the stairdelier is lit with energy-efficient LED lights that consume far less energy than normal accent lighting. A green roof terrace at the sixth floor has been planted with native grasses and wildflowers. Because of the tight floor heights, a large number of very small heat pump air conditioners were utilized within the ceiling cavity, creating a very efficient system. This essentially zones the AC so that people working in one area can have their windows open or the AC off while others have the AC on. Recycled materials were used as often as possible, including the corrugated glass canopy, which is made from glass salvaged from the Philadelphia Naval Yard.